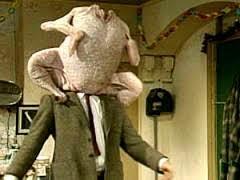 Image from “Merry Christmas, Mr. Bean”, a TV episode from the British sitcom, “Mr. Bean”. Our fearless Nevins Library staffers have kindly contributed stories of past Thanksgiving mishaps, so if your Thanksgiving isn’t up to Norman Rockwell standards, have no fear — you are not alone! A few Thanksgivings ago, our family had gathered together at our house. My cousin came with her two-year-old son, E. E was eating in his high chair, positioned just next to my father at the head of the dining room table. About halfway through the meal, E stopped eating and promptly threw up right on to his tray. Everyone leapt into one sort of action or another. My brother bolted for his room to avoid a chain-reaction of puking. My mother, aunt and cousin all hurried E off to the bathroom to clean him up. Other family members milled out around the room, waiting for calm to settle back down.My father? Well, he kept right on eating. Categories: Celebrations, National Observation | Tags: mishaps, Thanksgiving, turkey | Permalink. For as far back as I can remember, my parents always hosted the Thanksgiving feast. We had to have the biggest turkey my Dad could find, usually between twenty-five and twenty-eight pounds even though we had about ten to twelve people sharing the meal. In the fall of 1987 after moving into our new home in late September, my husband and I decided that it was time my parents passed the torch to us. My Mom’s health had been failing that year, so we had an extra incentive to continue the tradition of finding the largest bird available and duplicating whatever my parents would have provided. My three young children ages five, three, and one and a half were happy to have “the party” at our house. Since my Mom and Dad had always “dressed” the bird about 5:00 am on Thanksgiving morning while I slept, I had never actually witnessed the process. (Unfortunately I didn’t have You Tube to rely on.) Therefore, my Dad arrived at our home about 5:00 am to show my husband and me exactly what needed to be done. Now for the rest of the story…. After my husband closed the oven door, he did the unthinkable! For whatever reason he moved the lever to start the self-cleaning process! Now this decision on his part was so much out of character. He was not a man who had an aversion to cooking or any other “household chore” at all. He had used this very oven several times since our moving in. All of a sudden he got that “Oh, no, what have I just done?” look. I immediately went searching for the oven manual since we had never used the self-cleaning function. As I read the pages, it seemed impossible to save the prized possession of our Thanksgiving Dinner from a 500 degree scorching! I could just imagine the fire trucks arriving in our driveway with their sirens blaring! Only my children would enjoy that. I then remembered Mike, the small-appliance repairman, who lived about fifteen minutes away and whom I had called several times in the past at my previous home for more ordinary repairs. After listening to my explanation of the reason for the call and reacting with a howl, he graciously agreed to try to save the day! I am happy to confirm that we had a somewhat uneventful Thanksgiving Day after that mishap. The turkey and the rest of the meal was delicious, and our guests shared a chuckle, even my husband who could laugh at himself. I can also say that Mike has told me on each future visit that he has repeated my Thanksgiving story to innumerable customers especially to anyone with an oven problem! No one has been able to surpass our Thanksgiving story! From “Merry Christmas, Mr. Bean”, a TV episode from the British sitcom, “Mr. Bean”. Many years ago, when I was a child, we had the Thanksgiving to remember or more specifically the day after…but not necessarily in a good way. Mom had prepared the penultimate Thanksgiving dinner for the family. Everyone was there, inlaws, outlaws, cousins and grandparents. She and my dad had spent the better part of the early morning hours making the special stuffing and preparing the bird for its fate in the oven. As was her custom, my mom had prepared all the vegetables the night before so they just had to be cooked at the proper time. All the best china had be set on the table and everything was ready for serving. The family gathered at the table and enjoyed a wonderful meal, kids in the kitchen and adults in the dining room. We were happy to be there and before long filled with the flavors of the season. After dinner, it was time for football., As always the Lions were playing and the men were enjoying some tv time and nap time as I recall. The women were in the kitchen, taking care of all the chores of cleaning up and saving leftovers. Mom was anticipating a soup the next day and of course we were all salivating over the prospect of the best part of Thanksgiving, the sandwich the next day. Since the fridge was already full, mom decided that the bird and some of the stuffing would just be ok on the screen porch for the night. The day drew to a close and we looked forward to a Friday holiday with yummy leftovers. During the night the entire family was awakened by the clamor of screen ripping and doors slamming and dogs growling and barking. The leftovers were gone, everything…bird, stuffing, even some leftover gravy still in the pot. It was obvious by the footprints on the floor that our sandwiches were not going to happen, and neither was the soup. A bunch of neighborhood dogs had made it clear that the screen porch was not the place for storing leftovers and they made a clean or not so clean get away with all our leftover Thanksgiving meal. Thus started the tradition of Chinese food on the day after the holiday. But I never forgot the look on my mom’s face or the words that came out of her mouth as the pack of hounds tore off down the street with gravy dripping from their paws and a turkey carcass in their mouths’. Remember this caution….secure your leftovers….you never know who might need a sandwich in the middle of the night! Categories: Celebrations, National Observation | Tags: Thanksgiving, turkey | Permalink.